Make a jellyfish in a bottle! This small project is one the optional activities for next week's homework as our topic this term is Under the Sea. I thought I would put it up a bit early because it might be a great weekend activity. 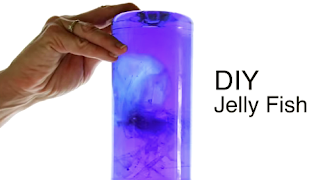 All you need at home to make a jellyfish in a bottle is a plastic bag, string, food colouring and a bottle. Leave a comment and tell us how it went. Click here for the short instructional video. I made mine with green food colouring. It is cool!